The colorful oxen that have lined Hopewell Valley’s landscape since August are turning the local arts council green to the tune of $73,000. 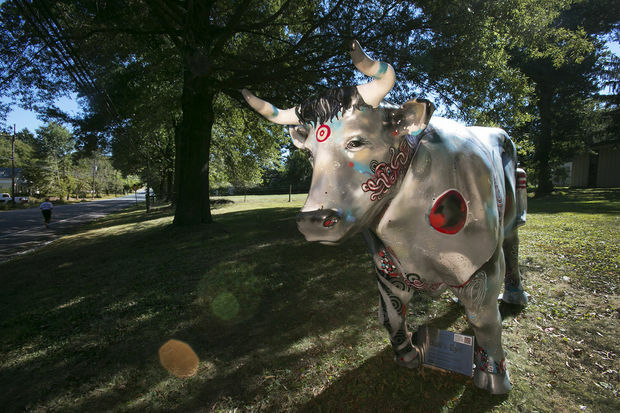 The money, raised by auctioning off 33 of 69 decorated fiberglass oxen, will be used by the nascent Hopewell Valley Arts Council for future public arts projects and workshops. This project, “The Stampede,” was the arts council’s first big project after being established early this year. When the life-sized oxen arrived in March, they were white and blank of any design. Artists then embellished them and the arts council installed them throughout Hopewell Township, Hopewell Borough and Pennington. An online auction featuring 33 of the oxen ended Sunday ahead of a celebration of the project at Hopewell Elementary. The total amount of money bid on the oxen hovered between $20,000 and $30,000 for a long time, project coordinator Liz Bell said. Then as the auction drew to a close, something changed. “In the last 24 hours it just popped,” Bell said. The auction brought in a total of $73,581. Every ox sold for at least $1,200, with “Luke the Celtic Ox” earning the top bid at $4,817. Another 11 oxen, including one that was just revealed Sunday, will be sold in a live auction at a gala in January. The remaining oxen were prepurchased by sponsors to fund the project. The oxen that will be auctioned off will be featured together in a herd somewhere in Hopewell Valley later this fall. The process has been a gratifying one for the arts council. “We certainly worked very hard in putting this together and learned a lot in the process,” Bell said. The project was intended to increase awareness of arts in the community and raise funds for the council. Bell said she thinks both objectives were achieved. “I think the community has an idea that there’s an arts council in town,” she said. Now, the council will begin its educational workshops on crafts, including ornament making and jewelry design. The oxen are being picked up from their various locations this week, but some can still be viewed.